(Trent Nelson | The Salt Lake Tribune) Utah Utes center Jayce Johnson (34) as Utah hosts Oregon State, NCAA basketball in Salt Lake City on Saturday Feb. 2, 2019. (Trent Nelson | The Salt Lake Tribune) Utah Utes forward Timmy Allen (20) as Utah hosts Oregon State, NCAA basketball in Salt Lake City on Saturday Feb. 2, 2019. (Trent Nelson | The Salt Lake Tribune) Utah Utes forward Timmy Allen (20) shoots, defended by Oregon State Beavers center Gligorije Rakocevic (23) as Utah hosts Oregon State, NCAA basketball in Salt Lake City on Saturday Feb. 2, 2019. (Trent Nelson | The Salt Lake Tribune) Utah Utes forward Timmy Allen (20) looks to pass, defended by Oregon State Beavers guard Zach Reichle (11) and Oregon State Beavers center Gligorije Rakocevic (23) as Utah hosts Oregon State, NCAA basketball in Salt Lake City on Saturday Feb. 2, 2019. (Trent Nelson | The Salt Lake Tribune) Utah Utes forward Timmy Allen (20) shoots as Utah hosts Oregon State, NCAA basketball in Salt Lake City on Saturday Feb. 2, 2019. (Trent Nelson | The Salt Lake Tribune) Utah Utes guard Sedrick Barefield (2) defended by Oregon State Beavers guard Ethan Thompson (5) as Utah hosts Oregon State, NCAA basketball in Salt Lake City on Saturday Feb. 2, 2019. (Trent Nelson | The Salt Lake Tribune) Utah Utes center Jayce Johnson (34) shoots, defended by Oregon State Beavers center Gligorije Rakocevic (23) as Utah hosts Oregon State, NCAA basketball in Salt Lake City on Saturday Feb. 2, 2019. (Trent Nelson | The Salt Lake Tribune) Utah Utes guard Charles Jones Jr (1) as Utah hosts Oregon State, NCAA basketball in Salt Lake City on Saturday Feb. 2, 2019. (Trent Nelson | The Salt Lake Tribune) Utah Utes forward Timmy Allen (20) and Oregon State Beavers forward Tres Tinkle (3) reach for a loose ball as Utah hosts Oregon State, NCAA basketball in Salt Lake City on Saturday Feb. 2, 2019. (Trent Nelson | The Salt Lake Tribune) Utah Utes guard Sedrick Barefield (2) shoots with Oregon State Beavers guard Antoine Vernon (13) defending as Utah hosts Oregon State, NCAA basketball in Salt Lake City on Saturday Feb. 2, 2019. (Trent Nelson | The Salt Lake Tribune) Utah coach Larry Krystkowiak as Utah hosts Oregon State, NCAA basketball in Salt Lake City on Saturday Feb. 2, 2019. (Trent Nelson | The Salt Lake Tribune) Utah Utes guard Sedrick Barefield (2) shoots with Oregon State Beavers guard Antoine Vernon (13) defending as Utah hosts Oregon State, NCAA basketball in Salt Lake City on Saturday Feb. 2, 2019. (Trent Nelson | The Salt Lake Tribune) Utah Utes guard Sedrick Barefield (2) drives around Oregon State Beavers center Gligorije Rakocevic (23) as Utah hosts Oregon State, NCAA basketball in Salt Lake City on Saturday Feb. 2, 2019. At left is Oregon State Beavers guard Stephen Thompson Jr. (1). (Trent Nelson | The Salt Lake Tribune) Utah Utes guard Sedrick Barefield (2) drives around Oregon State Beavers center Gligorije Rakocevic (23) as Utah hosts Oregon State, NCAA basketball in Salt Lake City on Saturday Feb. 2, 2019. At left is Oregon State Beavers guard Stephen Thompson Jr. (1). (Trent Nelson | The Salt Lake Tribune) Utah Utes guard Charles Jones Jr (1) drives on Oregon State Beavers guard Antoine Vernon (13) as Utah hosts Oregon State, NCAA basketball in Salt Lake City on Saturday Feb. 2, 2019. (Trent Nelson | The Salt Lake Tribune) Utah Utes guard Sedrick Barefield (2) as Utah hosts Oregon State, NCAA basketball in Salt Lake City on Saturday Feb. 2, 2019. (Trent Nelson | The Salt Lake Tribune) Utah players huddle, down by eight points late in the second half, as Utah hosts Oregon State, NCAA basketball in Salt Lake City on Saturday Feb. 2, 2019. (Trent Nelson | The Salt Lake Tribune) Oregon State Beavers guard Stephen Thompson Jr. (1) and Utah Utes forward Timmy Allen (20) as Utah hosts Oregon State, NCAA basketball in Salt Lake City on Saturday Feb. 2, 2019. (Trent Nelson | The Salt Lake Tribune) Utah coach Larry Krystkowiak as Utah hosts Oregon State, NCAA basketball in Salt Lake City on Saturday Feb. 2, 2019. (Trent Nelson | The Salt Lake Tribune) Utah coach Larry Krystkowiak as Utah hosts Oregon State, NCAA basketball in Salt Lake City on Saturday Feb. 2, 2019. (Trent Nelson | The Salt Lake Tribune) Utah Utes forward Riley Battin (21) and Utah Utes center Jayce Johnson (34) reach for a rebound as Utah hosts Oregon State, NCAA basketball in Salt Lake City on Saturday Feb. 2, 2019. Utah caused enough problems of its own Saturday, but Craig Robinson deserves some of the blame for another loss that moved the Utes’ season toward the crumbling stage at the halfway mark of the Pac-12 basketball schedule. 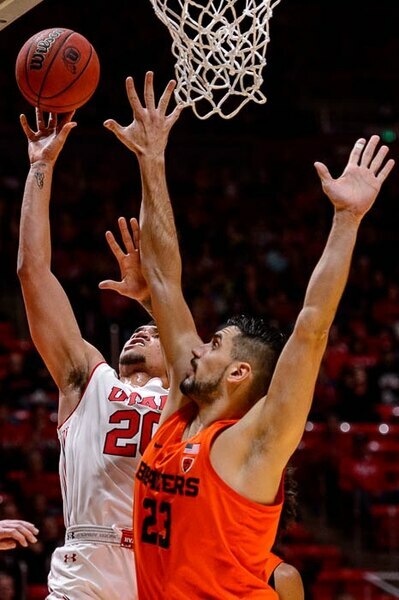 If Robinson had succeeded as Oregon State’s coach, OSU’s Tres Tinkle probably would have become a Ute and none of this stuff would have happened in the second half of the Beavers’ 81-72 victory at the Huntsman Center. After a dreadful first half, the Utes rallied repeatedly, only to have Tinkle make one momentum-killing play after another. A son of OSU coach Wayne Tinkle, the junior forward likely would have signed with Krystkowiak, his father’s teammate and former boss at Montana. But then came the opportunity to join his father in the Pac-12 after Wayne Tinkle replaced Robinson at Oregon State. Tinkle finished with 31 points, apparently not fazed by chants of “Daddy’s boy” from the student section. His production included a 3-pointer when Utah trailed by six, a rebound basket when the Utes were within five and then the dagger – from about 5 feet beyond the 3-point line with the shot clock winding down, Riley Battin’s hand in his face and Utah down by four with 1:43 remaining and the building sounding louder than any time this season. But life may get worse for the Utes (11-10, 5-4) instead of better, because the second half of their conference schedule is more difficult. That’s why the Utes desperately needed Saturday’s game, a theory that fails to explain why they played so timidly. The Beavers grabbed seemingly every loose ball, drew a bunch of fouls and kept the Utah from scoring. 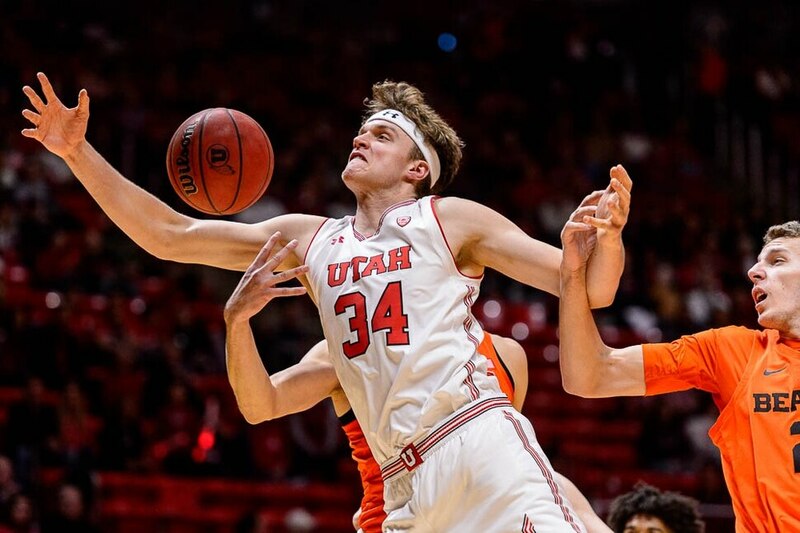 The Utes missed 10 straight shots in the first half, partly because they passed up decent looks and then fired wild shots in an effort to beat the 30-second clock. Utah had four shot-clock violations in the game. Staging the annual Huntsman Strong game for cancer research support on the one-year anniversary of Jon M. Huntsman’s death, Krystkowiak wanted to honor a major influence in his life with a determined effort by Utah. That happened only in the second half, after he appealed to his team with a Huntsman-themed speech. “That’s where we’ve got to draw the line, in terms of effort,” Krystkowiak said in the postgame news conference. Krystkowiak liked his team’s response, and just imagine if the Utes had completed their comeback after trailing by 15 points early in the second half. Huntsman’s frequent messages to the team usually ended, “Go big!” The players and coaches wore patches with that phrase Saturday, and Utah’s rally carried out that wish. The problem was that Tinkle went bigger. 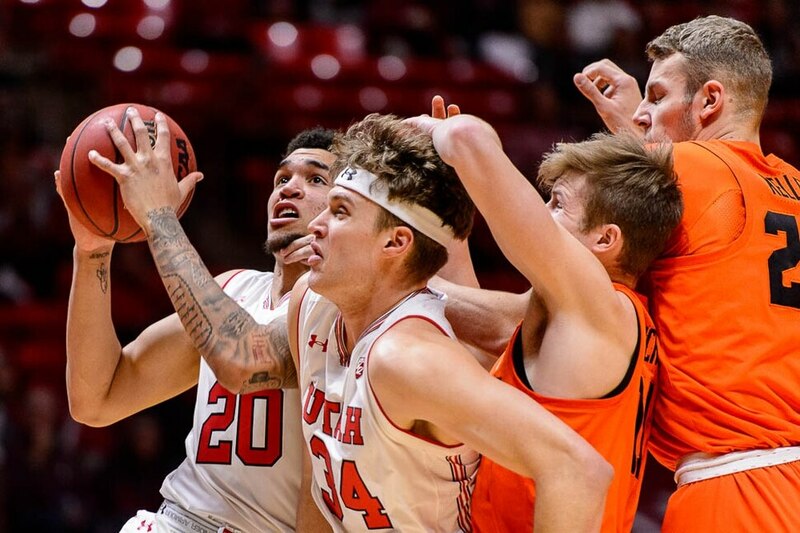 If not for him, Ute freshman Timmy Allen’s season-high 24 points and Sedrick Barefield’s 19 might have been enough to give Utah a memorable win. Instead, the Utes were left to lament how they played only halfway acceptably, on an important day for the program. Editor’s note: Paul Huntsman, a son of Jon M. Huntsman Sr., is owner and publisher of The Salt Lake Tribune.